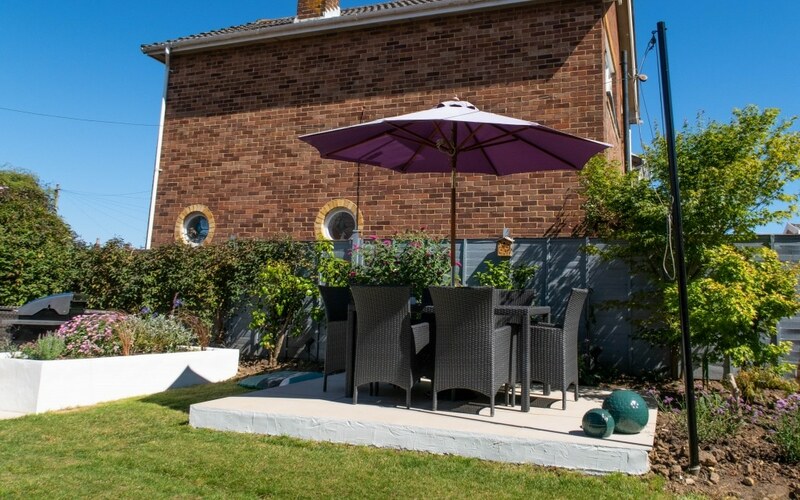 Come and take a look around our finished garden! 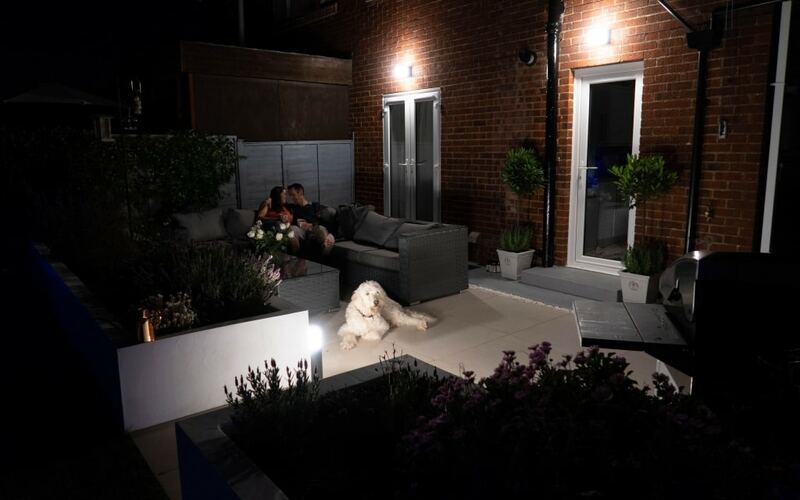 We have been working hard over the last couple of months to get the garden finished off and you may have already seen our brilliant new Philips Hue outdoor lights over on the recent post. 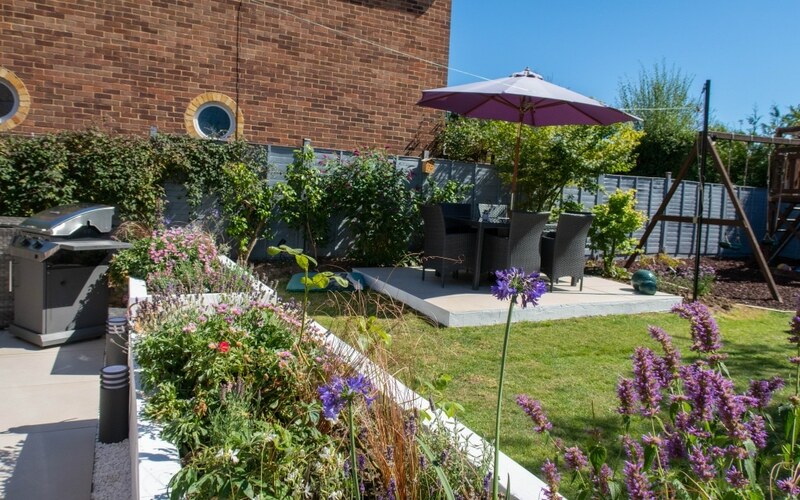 So I thought I would give you a proper garden tour and show you all around our finished garden. We have been in our home for 5 years now and it was a jungle when we moved in. I look at the pictures now and cannot believe the change, and we have done all of it ourselves too. Now look at this from the same angle! It’s a much more usable space for us and our family. We have designed it to be suitable for us, given us all a space to be able to use together or alone. 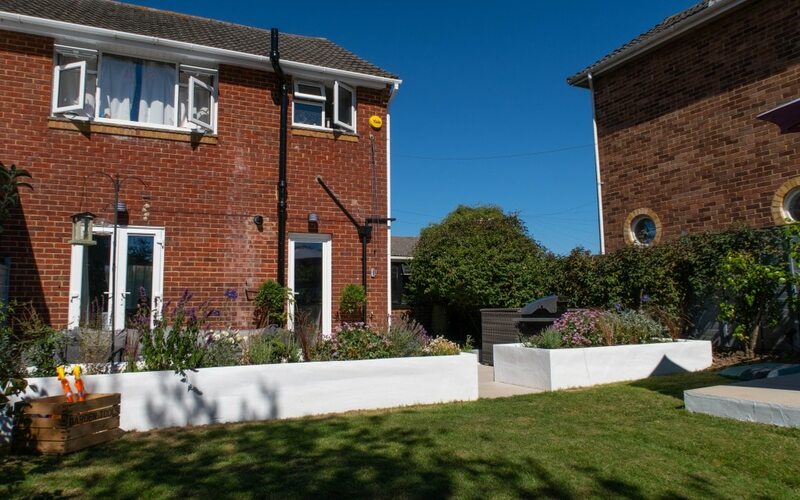 Last year we added the white walled planters which I love and have filled out this year with plants. 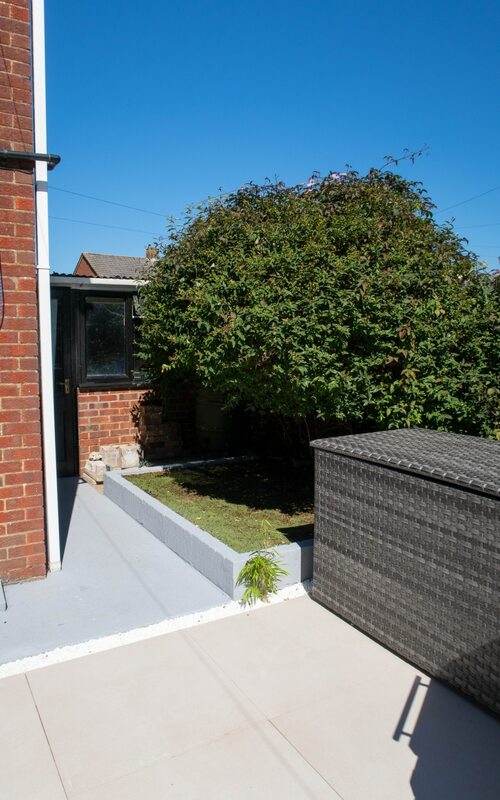 It’s a space that I can add some really lovely plants but as it gets a lot of sun I do have to be aware of what plants to add into here. They don’t all like so much heat! The planter furthest away struggled a bit more and the plants didn’t do as well. It could be to do with the sun, shade, more sheltered, I am not sure why but it just shows you that certain plants can be very particular with their conditions! 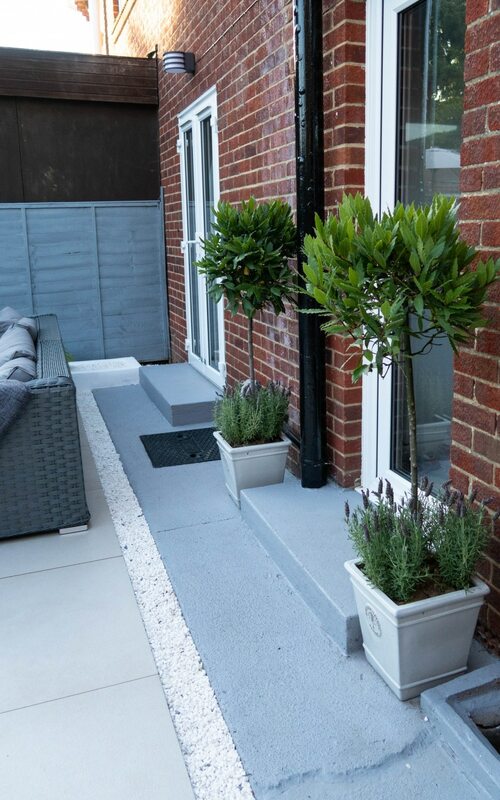 Having these planters positioned here sections off the garden spaces creating zones but also means the plants are at a higher position. Being at eye levels means you can see them so well when sitting on the sofa, but also from inside the house as well. 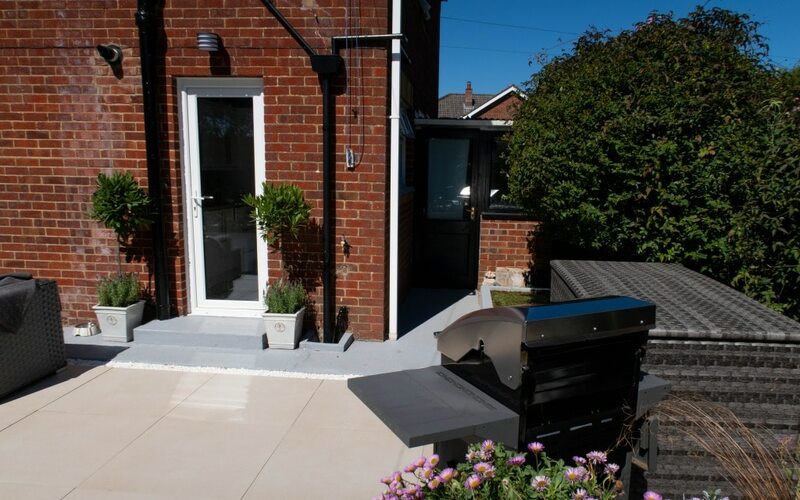 So this years new addition was to finish off the large patio directly outside the house. 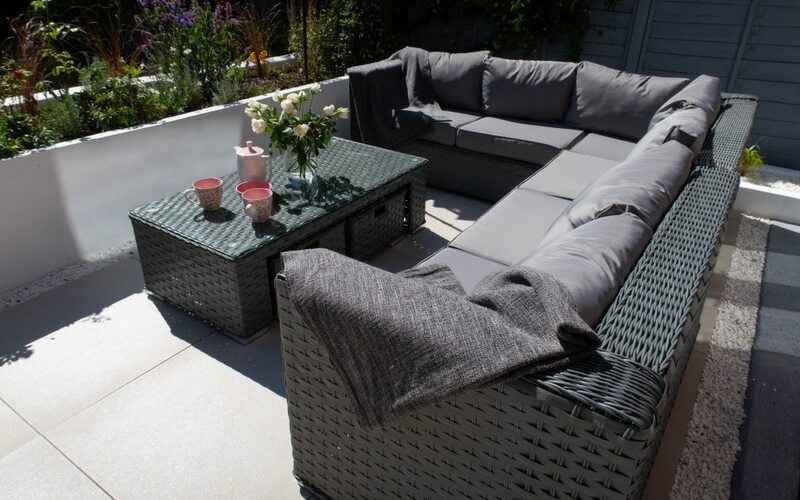 I really wanted to have a comfy outdoor sofa to be able to relax in the garden properly. My new favourite place is snuggled up in the corner! 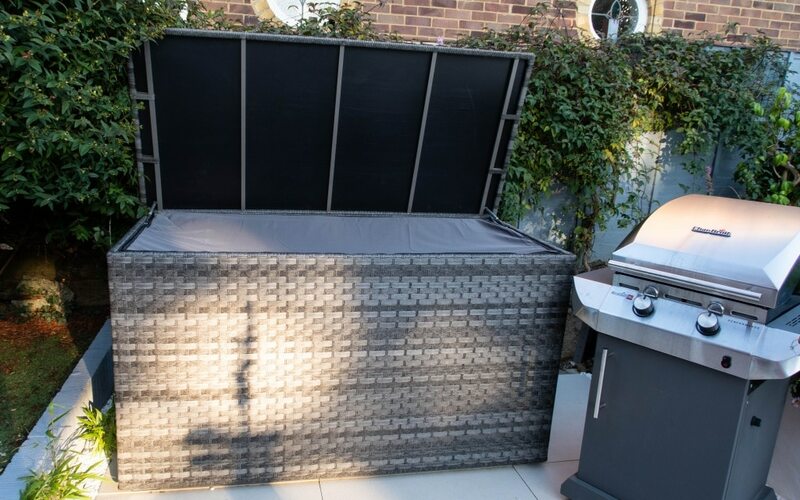 We purchased this from Groupon and I was keeping my fingers crossed it would be OK when it arrived, we were so pleased. It is comfy and the cushion pads spring back into place after you sit on them too. 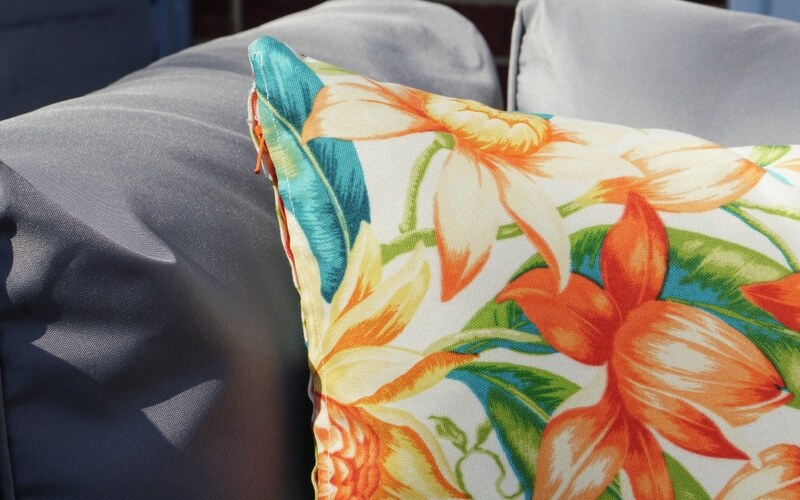 We have since added some amazing outdoor colourful cushions from Ragged Rose. 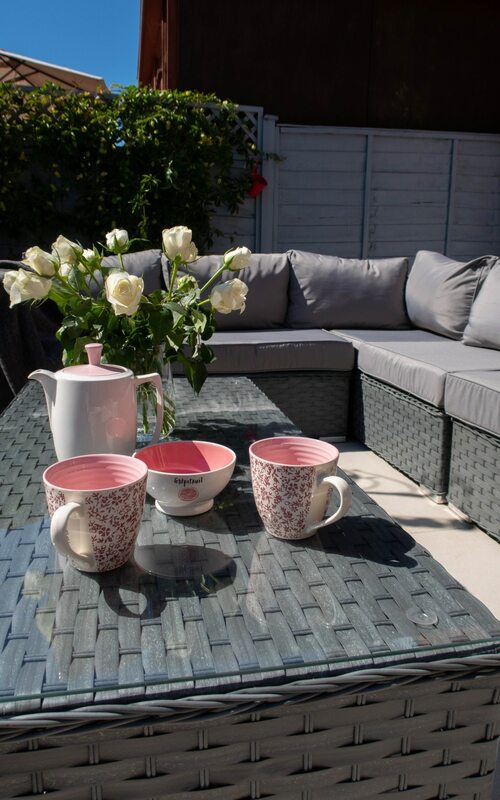 A lovely brand who want to inject some colour into our homes. They’re not afraid to use colours which I love! 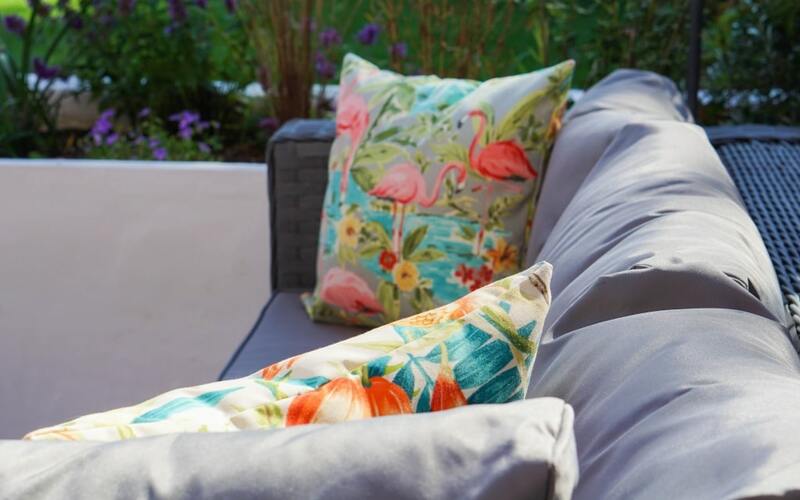 The plain sofa just calls for some colourful cushions to be placed onto it which then allows the colours of the garden to be pulled in too. I went for 3 cushions on the sofa and each in different fabrics, each one pulls in colours from the garden so you can easily get away with different patterns. I was very impressed by the quality of them too, edging is all neatly sewn and being showerproof too they will withstand a rain shower on them too. 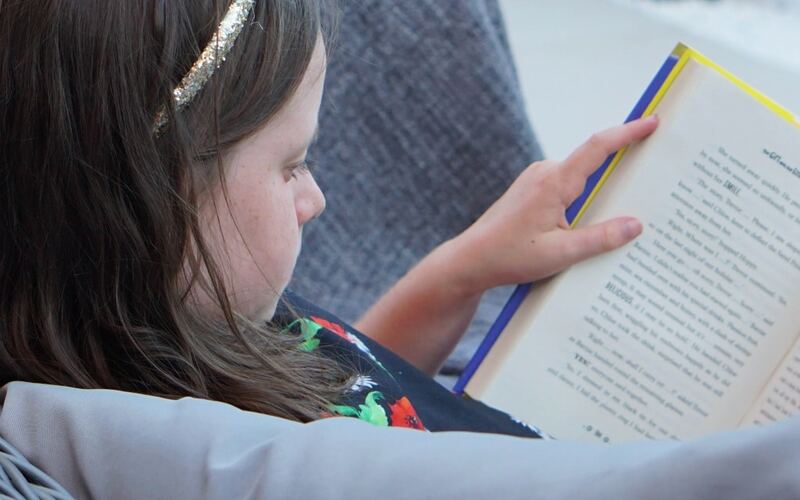 The children also have loved being able to come out here and sit on the sofa to read. It’s nice they can get outside to be able to do this. We have added our large porcelain tiles from Tile Mountain across the full width of the house. They can be used in both indoors and outdoors. 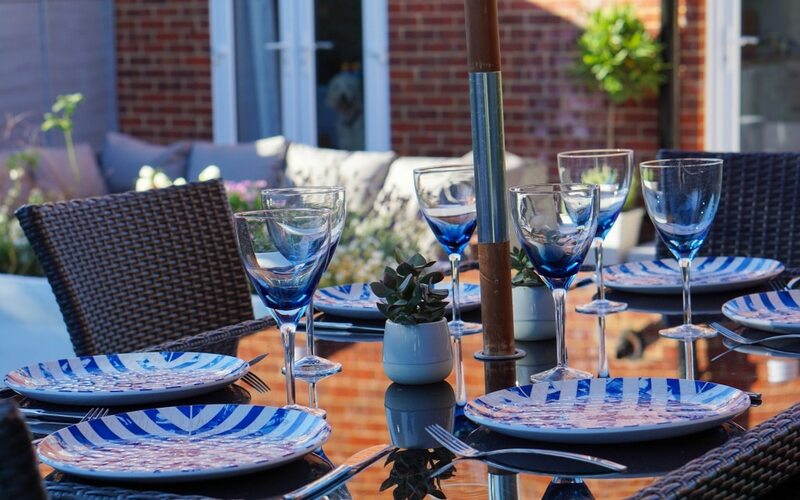 So perfect if you have a house and garden that is level to create that bringing outdoors indoors! 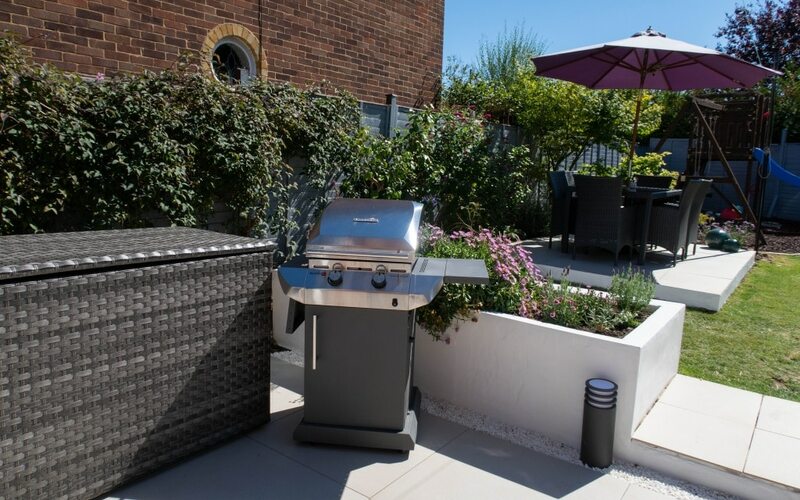 This now allows us to a place for BBQ, cushion storage box and still leaving a walk through space leading from the back door to the rest of the garden. 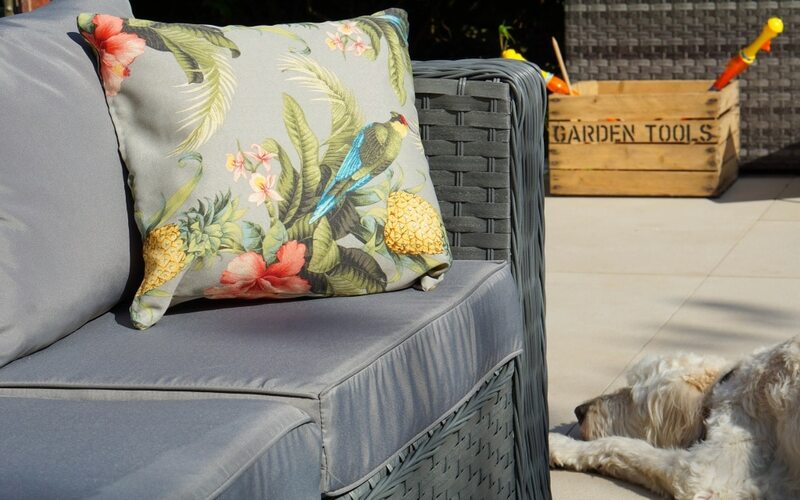 Be aware if you’re getting an outdoor sofa you will need a place for all the cushions. We don’t have space indoors for this so we have purchased a cushion storage box. 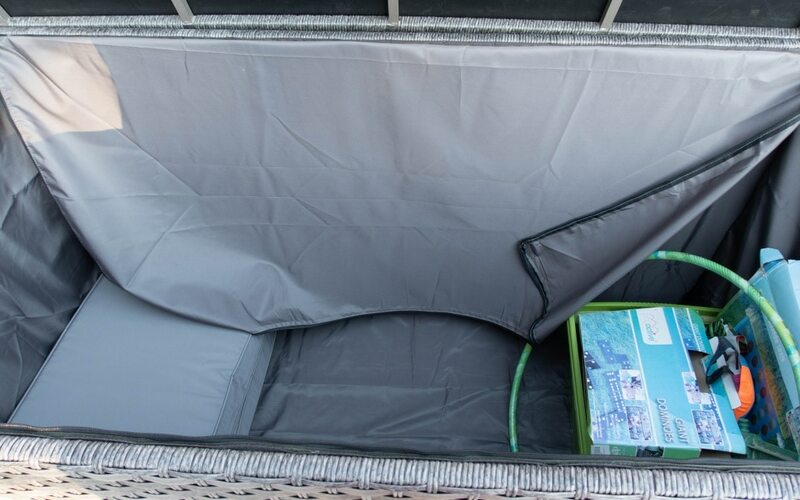 From Wayfair this rattan water-resistant outdoor storage box will protect the cushions from the outside elements. This box is huge but we pretty much fill it up with all the cushions from the 8 seater sofa and a 6 seat cushion pads. The inside zipped liner is water-resistant and we have had some heavy rain since using this and everything has stayed dry. We have now placed the dining table further up the garden on the little patio we made last year. I was planning on having a sofa on this space but we wanted a bigger sofa to fit us and friends on. It also is much more private on the large patio from our neighbours, so means I can relax without feeling like I can be watched! I don’t mind them watching me eat my dinner!! The play area for the children was one of the first things we did for them when we moved here. 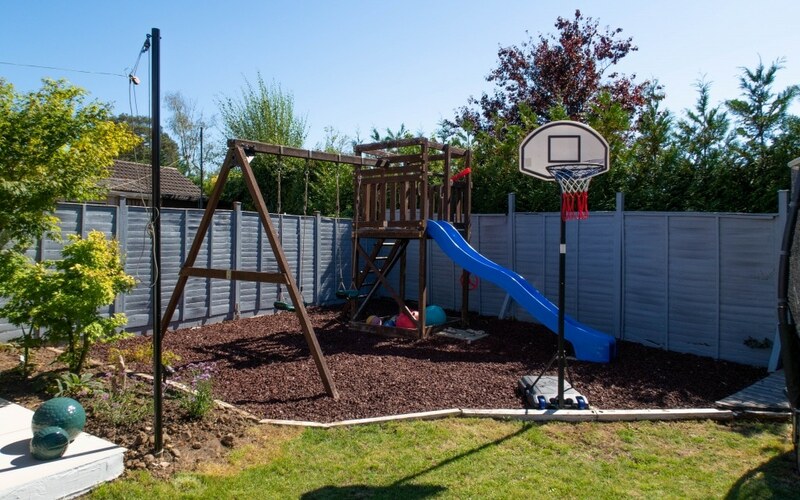 We finally had a nice garden space for them and by having the play area and toys encourages them to get outside to play. They still manage to argue as it’s only got two swings and not three! 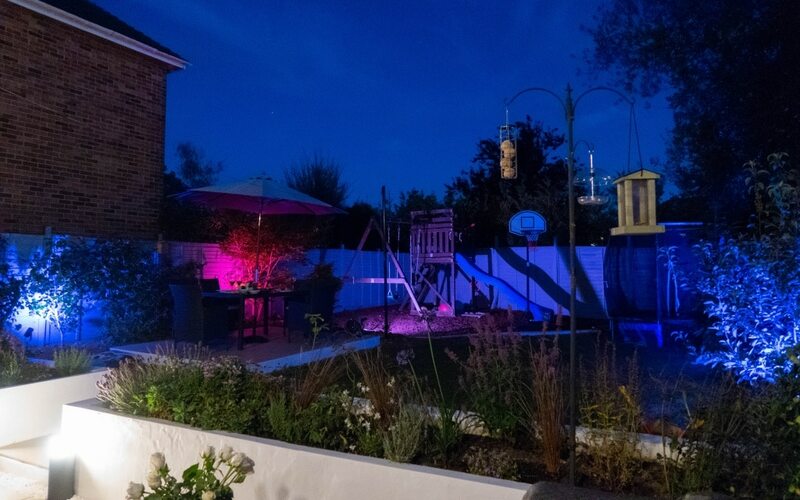 They’ve loved the new Philips garden lights as we can light up their play area with one of the Lily spotlights! I still wanted a lawn space for them to run around in and we were sent this lovely vintage apple crate to use in our new garden. I didn’t get a chance to get my garden tools in it, but the children got theirs in there! Vintage Apple Crates sell genuinely used rustic apple crates which can be used for all sorts of things, flower boxes, gift boxes, boot boxes, cat beds and many more things! I think it’s very cute with their toys in it. 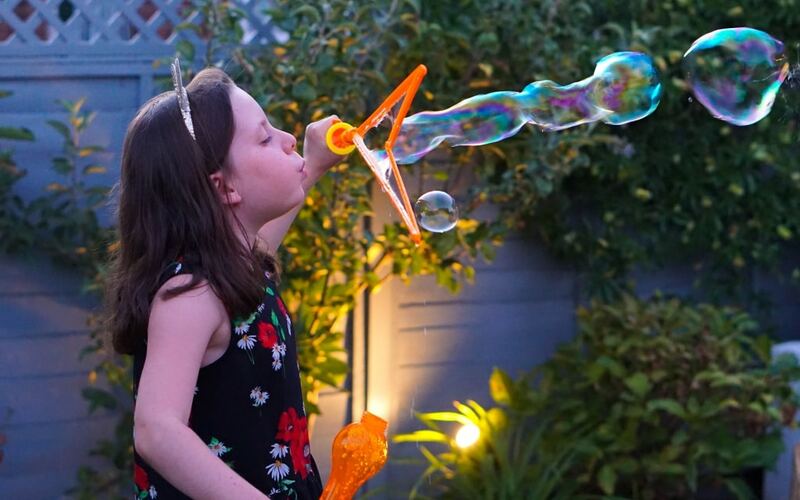 I picked up these amazing bubble blowers on Amazon, the make huge bubbles! We also have Gus the large dog so by having a lawned space for him to run around doing circles if he wants!! Even the dog has a space! To keep the dog from toileting on the lawn, killing it and with the children running around on it. We installed a dog toileting space tuck away in the corner for him. Not nice to look at I know but it is so practical. (How to make it is my most popular post on my blog!) He has learnt that this is his space and automatically goes on there now. I am growing some bamboo trees to the side of this now, they grow well so should start to hide this area from us too. When designing the garden space I have been thinking about screening to make the garden as private as it can be. We live in a residential road so there’s no hiding that we have houses around us. Luckily we have a bungalow behind us so no overlooking from the back but the house joined onto us can see very easily. So I looked into natural screening and bamboo came up as a good choice. It grows fast and can produce a good hedge style foliage. 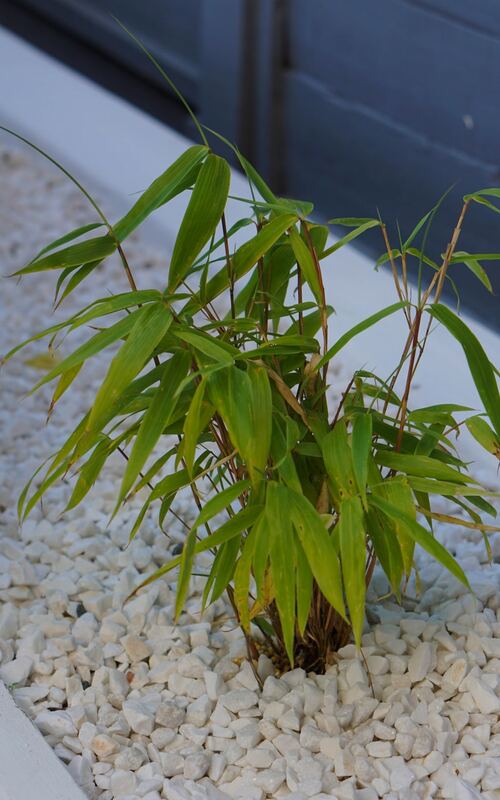 Be very aware on what bamboo you’re picking though as some have very vigorous roots that will branch off and grow everywhere and anywhere! You need to look for the clump forming ones and do your research. These are small now but should grow quite quickly and make a good hedging and natural screening. I have placed them behind the cushion storage box on the other side as well and grow up that fence for screening there. We had very old concrete flooring directly outside the back of the house. It was incredibly thick and has drainage underneath, so we didn’t want to pull all of this out as it would have been a very big job! So we painted it. 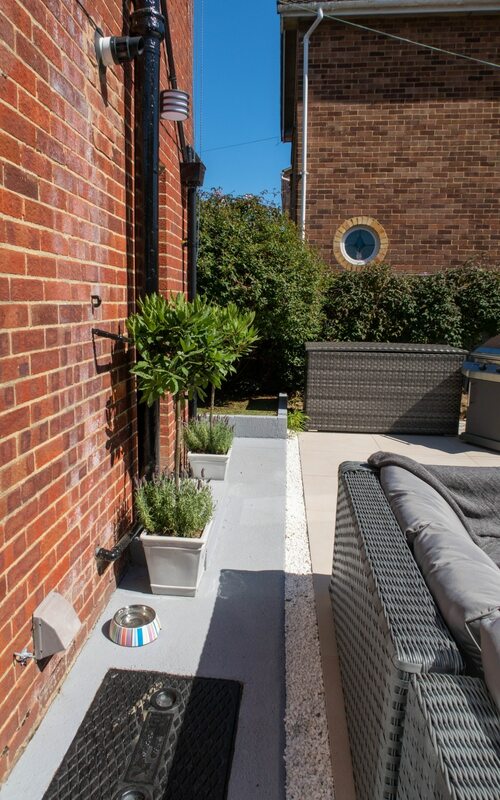 We used Dulux weathershield smooth masonry paint in colour Concrete Grey. Which looks nothing like it does on the paint chart! Much more blue grey than cold grey and it does look quite a bit more blue in this picture too! However it does go well with the fence colour too. 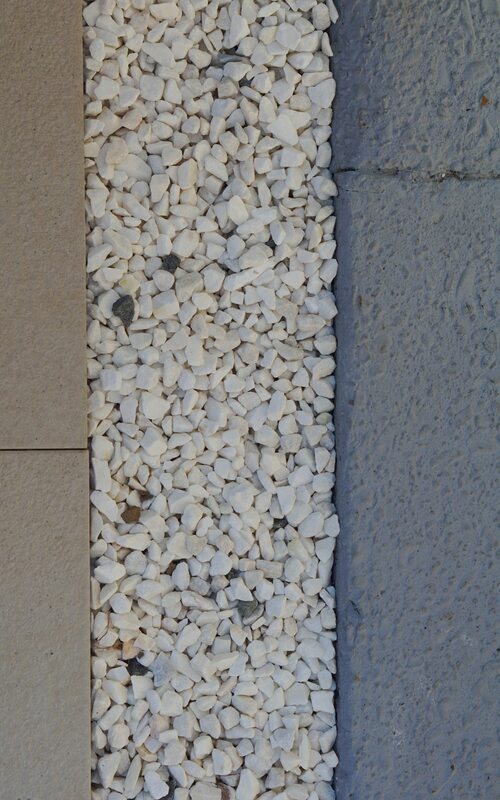 You may have noticed the white gravel placed around the garden too. This area of the garden use to fill up with rain water very quickly and easily if we had a lot of rain. So we wanted to create a soak away on each side of the patio. But I think it also looks lovely as edging to the patio as well. We are going to add more to the flower beds around garden as good weed control and to pull the patio area and the rest of the garden together. Although I need to go through and pick the grey ones out too!! We purchased this from Gravel Master and was very pleased with the service and delivery. I never thought I would love plants as much as I do! I find it very rewarding and relaxing to have flowers in my garden. I am not a gardener and I have a very lovely friend who loves gardening and offers great advice! However I am learning and I don’t think this garden would anywhere as nice with no plants in it. My husband spotted these two Bay Tress in B&Q with 50% off. They are usually really expensive, so I quickly grabbed them before anyone else could! Purchased some new pots and lots of lavender to plant around the bottom. 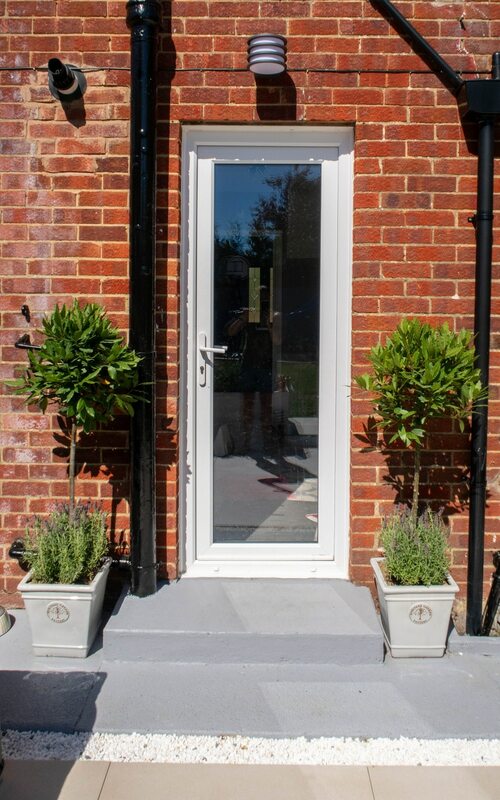 I am really pleased with them and I think they are good as hiding the pipe work a bit around the back door. Your eyes go to these and not the pipes as much. 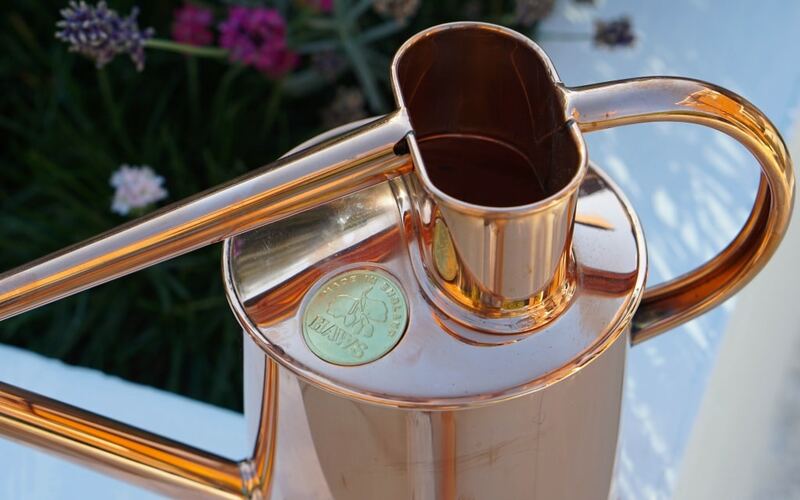 Of course the plants need watering and what better way to water them than with this stunning copper watering can I was sent. 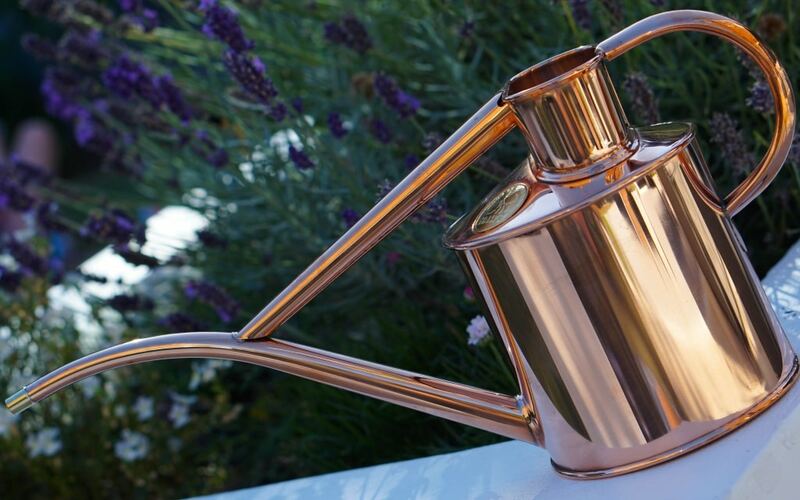 This Haws indoor copper watering can from Farrar & Tanner is perfect for watering the plants, hanging baskets and pots. It also looks stunning placed inside the home too ready for next time. 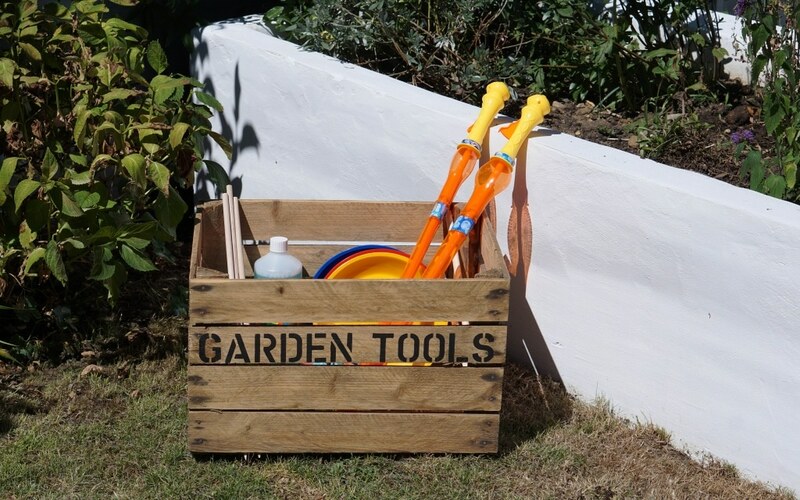 This would make a lovely gift for a keen gardening who loves good quality items. This has been a big wow factor to our garden renovation this year. 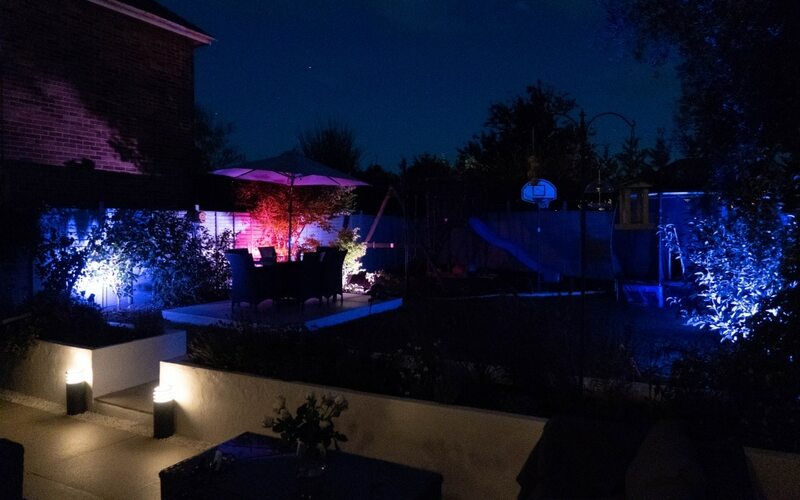 With the help of Philips Hue we have installed a brilliant new range of smart outdoor lighting in the garden. Wall lights, floor pedestal lights and little spot lights in the flower beds. I created a full blog post and video on these items if you want to find out more information. 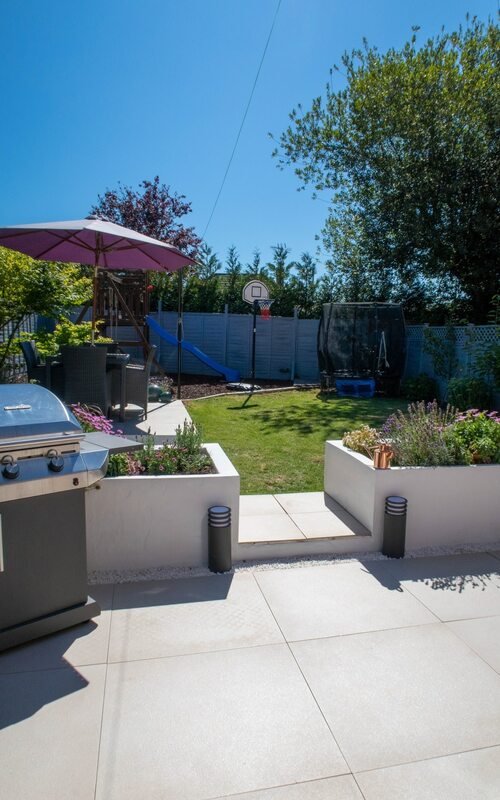 So what do you think of our garden? Would you be happy relaxing here?! Items marked with * is affiliate links – Items marked with ** are items I have been sent for either this garden project or in the past. However I only recommend items that I use and love myself. Ah thank you very much! We are so pleased with it and so glad we had a nice summer to enjoy it too! This garden is what dreams are made of! You’ve thought of absolutely everything (even a special space for the dog!). I love your sofa, and the way you’ve styled your dining table. As soon as you mentioned bamboo I instantly thought Oh no. We have an infestation of it, as the previous owners planted the ‘wrong’ kind, and it’s absolutely indestructible. It now spans about 10 feet of the raised border and is about 6 feet tall. 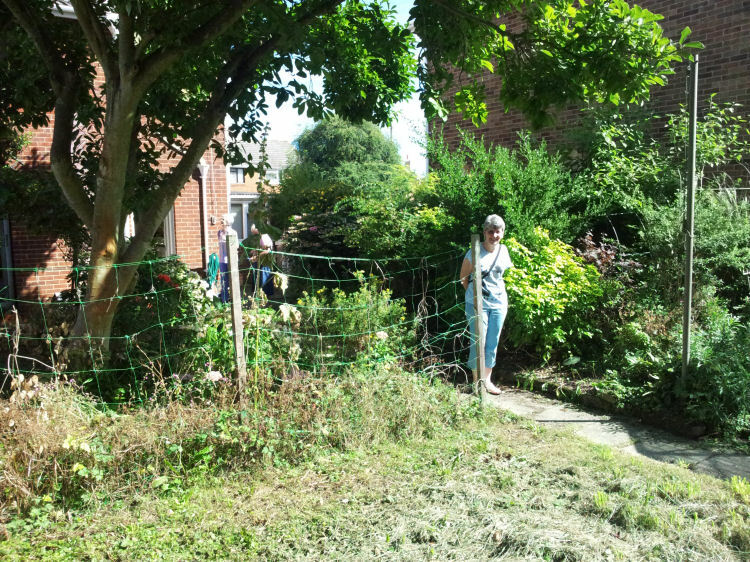 We’re getting the entire garden flattened and levelled out next year so it’ll be gone. It’s a nightmare. Well done for planting the right kind! Ah thank you very much, we are so pleased with it. Yeah I have heard it can get SO bad, I hope you manage to get rid of it when you flatten your garden. Yes I am very proud of it, it’s so relaxing to be able to sit outside there now and chill. I have some SERIOUS garden envy looking at your garden, it looks incredible. What a wonderful place to spend time, it’s got the proper wow factor! I want to come over and hang out in your garden! Everything is so lovely! I hope your family enjoys it! Fabulous love the design! So elegant and simple. I also love those bubble wands! They loved them too! 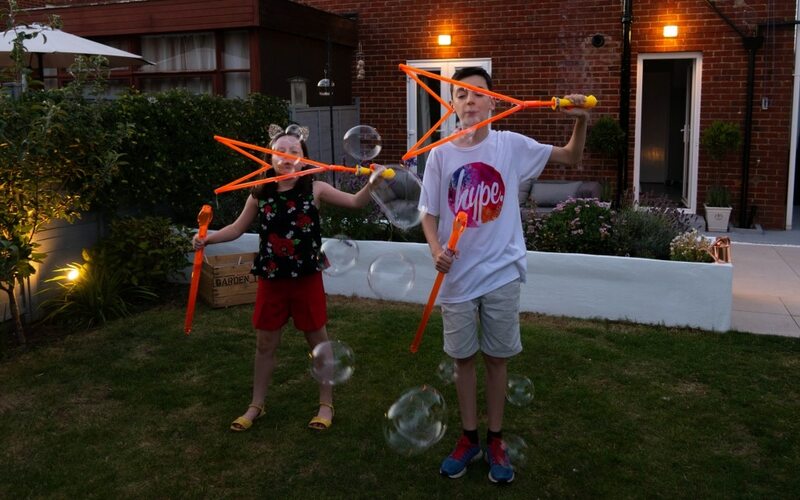 Made MASSIVE bubbles! You did such an amazing job with those planters. I am just amazed at how well everything worked out. It just looks too beautiful there. I love a good garden. And those boxes look beautiful and so well arranged. You have done an amazing job with it all. I love what you’ve done with your back yard. I’ve been wanting to spruce up my patio, but I never imagined that I could do it on a Groupon budget. This is so cool and it gives me lots of inspiration. You have done such a great job. I love the raised planters! 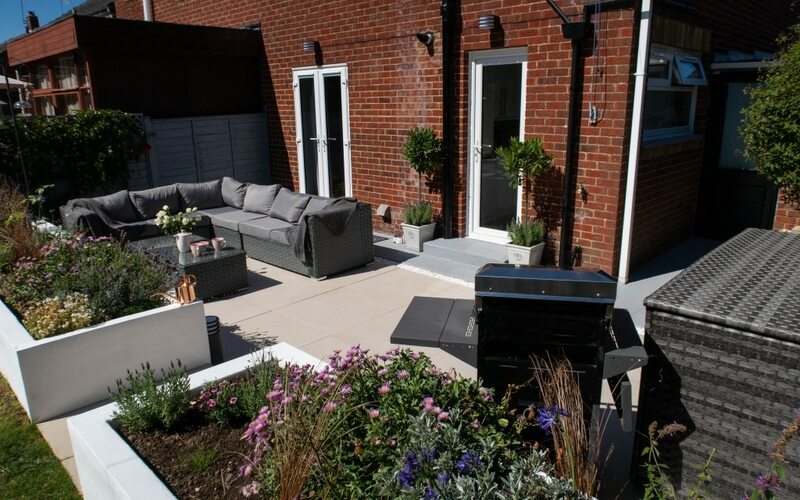 We have transformed our rented garden, but not quite to this scale…if it was our own then this would be something I would aim for! Your garden is absolutely beautiful. Total teansformation. I’d love a garden like that in our next home, it’s just stunning. No wonder you all love spending time out there! 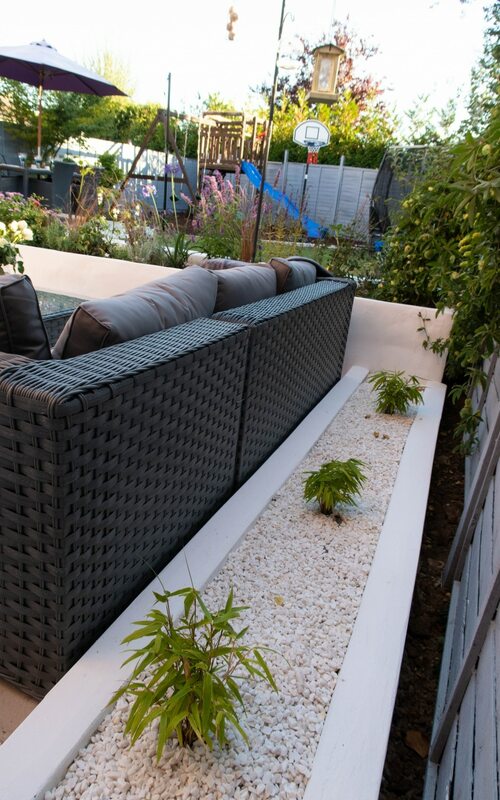 Wow what a great transformation, I love the raised white beds and the seating area. The kids play area looks brilliant. Thank you, yeah the kids love it! Im not jealous at all. 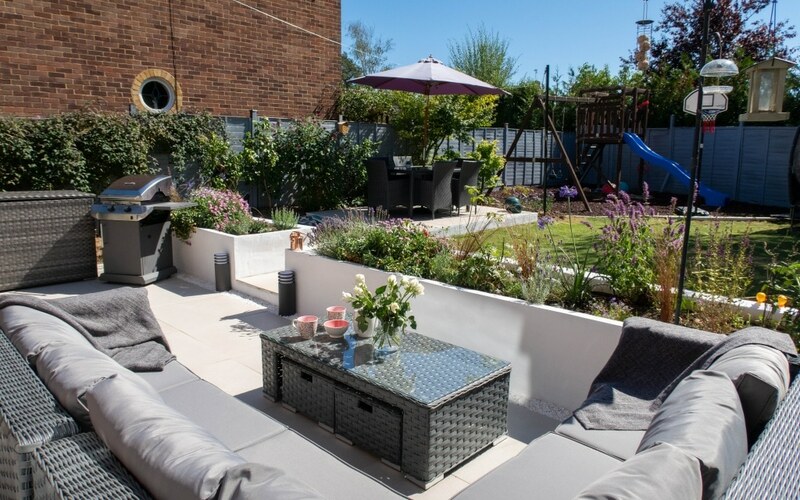 This is the exact garden I want, its got a very ibiza chilled feel. Were getting married next year so every penny is going to that at the minute. Wow it’s looking fantastic Steph! 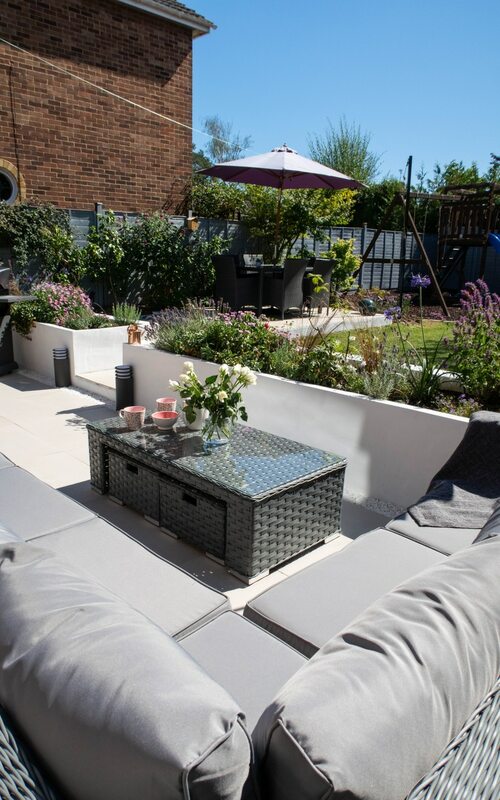 Loving the white walled planters and sofa area – wishing you many happy times in your garden! It’s so nice to have a space to get outside in, enjoy your renovations! Wow everything looks so neat and cozy. I personally love kids playground area 🙂 and that bamboo plant over the white stones looks fantastic. Thanks for sharing, love to use this item once I get my own house. Thank you, wonder how long it will stay neat for?! I’m partial to a swing now and again! This looks absolutely beautiful, all the hard work has paid off. Great ideas and lovely items. The lighting really adds luxury too. 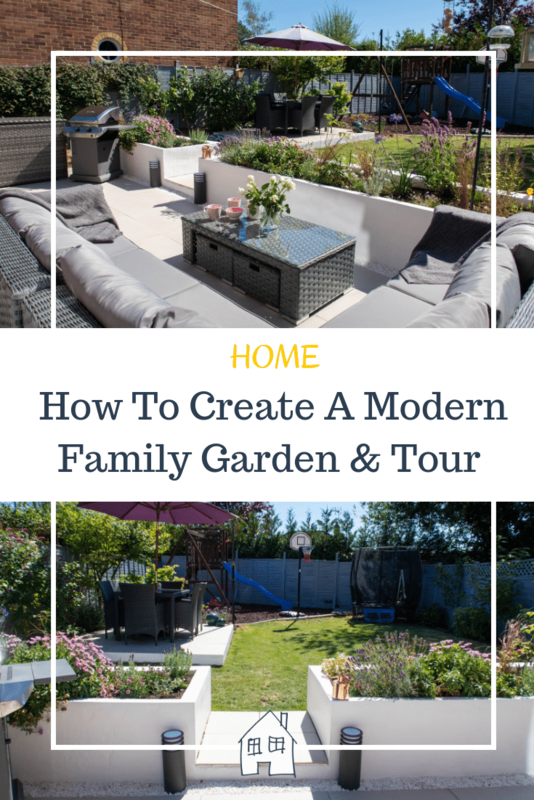 Home » Home and Interiors » Family Garden Tour – We’ve finished!